In 2002, Denver civic leaders began searching for ways to address the metro area’s problems with traffic, parking and pollution. It was also clear that the transportation system serving Denver and the Front Range of Colorado needed substantial upgrades to accommodate the kind of multi-modal options that a growing, progressive-minded metro area requires. So in 2004, Denver voters approved FasTracks, with 122 miles of new commuter rail and light rail lines, and 18 miles of bus rapid transit, all radiating out from one central, downtown hub, Denver Union Station. Symbolically, Union Station’s stately exterior, crowned by huge red letters that spell “Travel By Train,” not only serves as a friendly greeting from our city to its visitors, it’s the gateway to the American West, representing a key link between the city’s and the region’s past, present and future. Continuum and East West each saw an opportunity to go beyond the construction of a new train station. They envisioned a broader gesture in which the station would serve as the focal point for an entirely new neighborhood surrounding a brand new regional multi-modal transportation hub. Both Continuum and East West had already been active in new developments in this end of the downtown so, being of like minds, they decided to pursue the project together and formed, the Union Station Neighborhood Company. As part of their proposal to be considered as master developers, Union Station Neighborhood Company created an innovative design plan that would result in cost savings that were literally half the cost of the previously approved plan. It improved programming and provided a significant architectural opportunity, the signature design element of the open air Train Hall. It had the vision to create a public and private partnership that would become a benchmark in the industry. And it was the reason Union Station Neighborhood Company was ultimately chosen as the master developer in 2006. A transit hub where nine types of transportation converge, including pedestrian and bicycle traffic. A neighborhood experience that emphasizes walkability and accessibility, complete with new sidewalks, improved drainage and pedestrian friendly plazas. Additions and improvements to the citywide and regional rail system, with more than 120 miles of new track and over 70 park-n-ride lots. 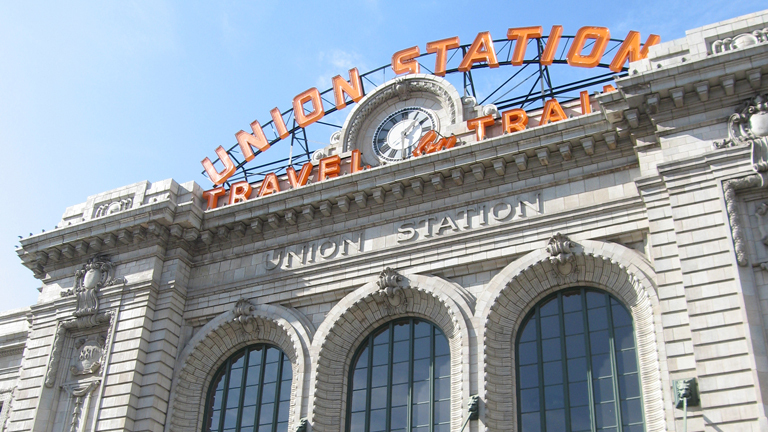 All of the rail lines, including commuter, light rail and Amtrak, stop at Union Station, providing a central location for riders to make transfers, shop, dine and connect. An improved regional bus system centered on a pristine new depot underneath 17th Street, between the station and the light rail plaza, with 22 bus bays and an underground, enclosed passenger concourse awash with light from the skylights above. Downtown Denver’s first commuter bike station, offering lockers and bike racks for day use as well as memberships for daily commuters. An expandable design that’s capable of growing to keep in step with the neighborhood, city and region. A state-of-the-art notification system featuring loud speakers and electronic message boards that is Americans with Disabilities Act compliant and advises hearing and hearing-impaired passengers about emergencies at the new transit hub’s bus concourse and train platforms. A masterplan that preserved a starring role for the 1881 vintage historic train station that is such a symbolically important landmark for the whole region.